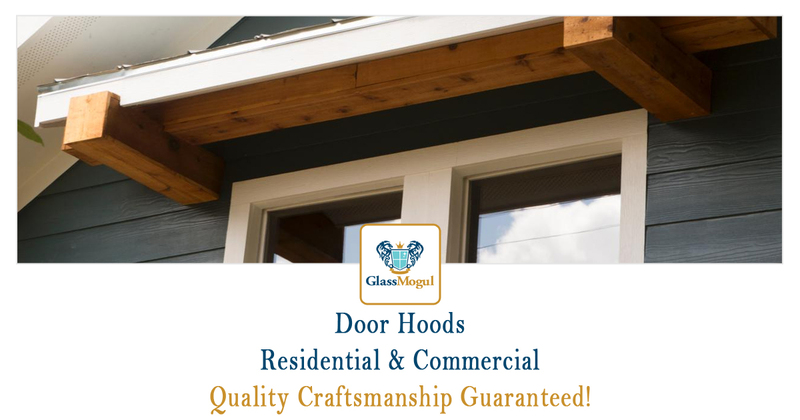 At GlassMogul we service, repair, install, and replace door hoods that come in all shapes and sizes for residential, commercial, and industrial applications. Our door hoods include front, back, and entry doors plus they come in an array of materials and colors to choose from. We carry many of the leading brand’s products and we install all The Home Depot and Lowe’s door canopies. Count on the skilled experts at GlassMogul to install your door canopy correctly, on time, and within the allotted budget. We install and repair Awntech, Fleetwood Windows & Doors, Lowe’s, MI Windows & Doors, The Awning Company, and The Home Depot door hoods to name a few. We perform work on all brands and styles, regardless of how old they are. When it comes to installing new door hoods, we offer awning, back, canopy, commercial, entry, front, industrial, metal, porch, rain, residential, and wooden door canopies.